We are currently in the return flow of a surface high pressure system with a weak cold front draped diagonally across central Illinois and Missouri. The strengthening upper level support will help to push the boundary through our area early Tuesday morning. The inflow of moisture is apparent, but not very significant. There is a nose of moisture extending into western Kentucky from the Gulf of Mexico. NAM 11/25 18Z run valid for Tuesday 11/27 03Z (9PM 11/26) showing 850mb dew points greater than 0 Deg C, heights, and winds. The nose of moisture is clearly visible as well as the frontal boundary across the Ohio River valley. The question is whether this precipitation will be of the frozen kind, and how much. GFS 11/26 00Z run valid for Tuesday 11/27 12Z (6AM) showing mean SLP, 1000-500mb thickness, and 6 hour precipitation in inches. The boundary between red and blue thickness lines marks the freezing line bisecting Kentucky. The GFS run above is showing the line of critical thickness (estimated freezing line) horizontally dividing Kentucky. Being situated near the freezing line makes determining the type of precipitation very tricky. Concerning the amount, both the NAM and GFS are concluding the precipitation at 12Z Tuesday, with the GFS calling for up to .09 inches and the NAM calling for up to .24 inches. 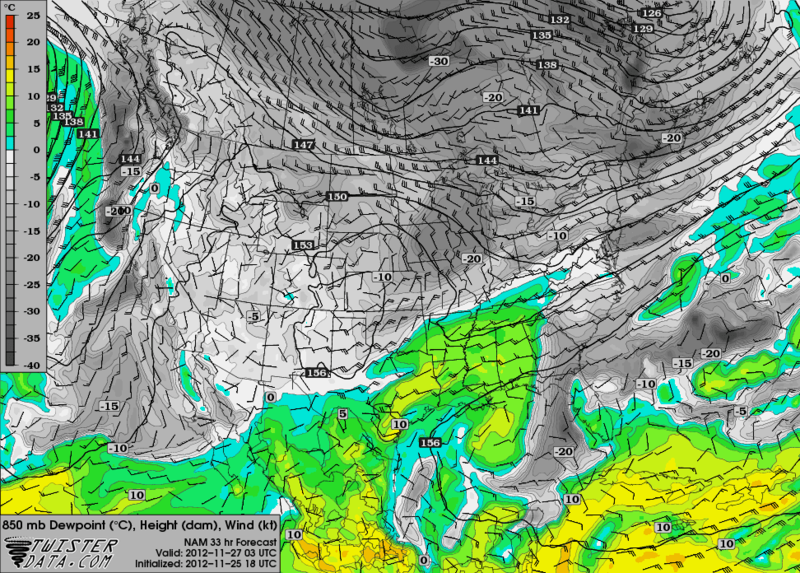 I will stick to the lower end, since the frontal lifting and moisture inflow are moderate at best. The temperature difference on either side of the front is lacking, thus further reducing its chance of strengthening, especially at night. Right now, precipitation received is looking like rain, but I will continue to monitor and provide updates to precipitation type up to the frontal passage if needed. After the frontal passage early Tuesday morning, a surface high pressure will settle into the region for the middle of the week bringing more of a return flow into Thursday.